I brought a couple of twigs home with this lichen for further study. After some study, I think they are a species of Rosette lichens (Physcia sp), but I think I need to scrutinize a lot more lichens before I can be certain. You can find a lot of gray, foliose lichens with black discs (the apothecia, or spore producing structure) around town if you look. While I was looking at the underside of these lichens through a dissecting scope, I discovered about a half dozen mites crawling around. It surprised me and kind of freaked me out. Maybe because I was only expecting non-moving lichen stuff. Maybe because bringing mites into my home is a little disturbing, even for someone who often lets the gross centipedes in the basement go free in the backyard instead of squashing them. Or it might be because I had just found a deer tick well attached to my arm, and the resemblance was unsettling. Anyway, it was fascinating. I had never considered the little things that might live on lichens. 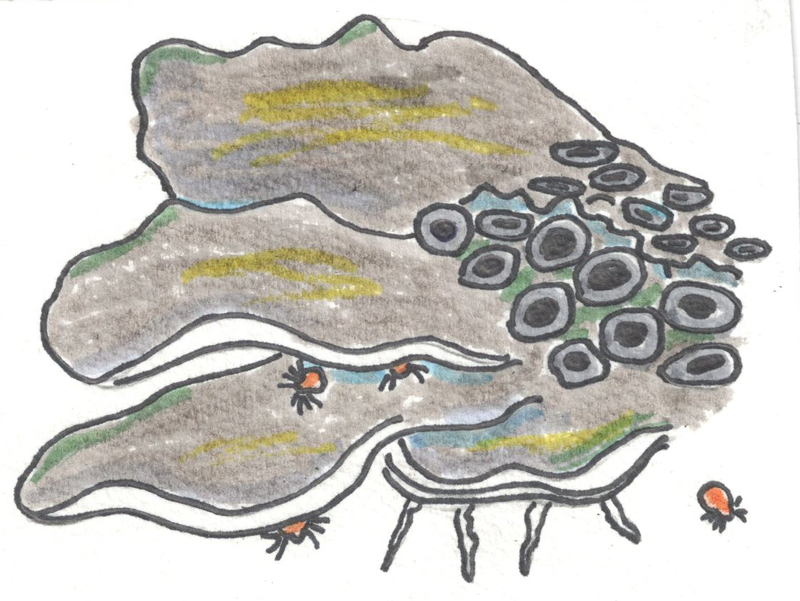 After a lead from "Lichens" by Oliver Gilbert, I discovered that there are a group of mites called the oribatid mites (family Oribatida) that are sometimes found living and feeding on lichens. 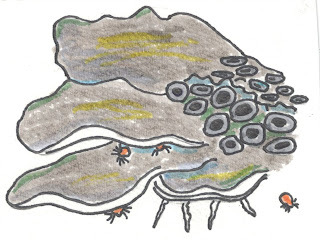 Most oribatid mites are decomposers that live in the soil, but some feed on lichens, which are then eaten by insects and spiders, which are in turn eaten by birds, forming a lichen based food chain. It's easy to overlook lichens, let alone the animals they support. More on Oribatid mites from Island Creek Elementary School in Virginia.